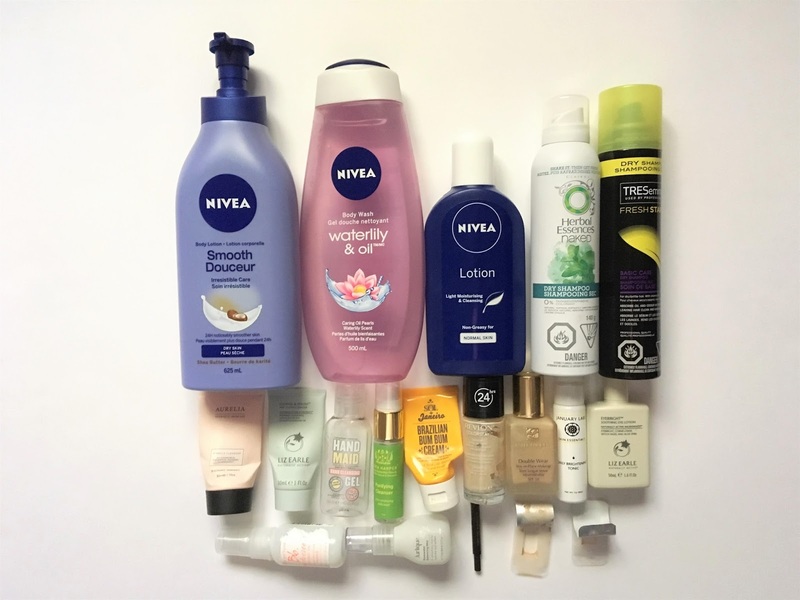 I’m finally back with a new empties post after putting a few mini versions up on Instagram and it feels good! Here’s what I’ve finished up recently! I love this – it really does make my skin feel smooth, it smells so fresh and it comes in a massive container! I also get it when it’s on special in Shoppers as it can be expensive otherwise! Will repurchase! Another favourite and one that I’ve repurchased quite a lot since being in Canada as I love the scent and again, its affordable! Have already repurchased! I got this mini in a GWP from Cult Beauty a few months ago and I’ll admit I didn’t love the scent at first though people seem to go crazy over it! I have grown to like it though and I recently got another bigger sample! It does make my skin feel super soft but I don’t love the glitter/sparkle that it gives off! Probably wouldn’t repurchase. An old favourite and one that I didn’t want to finish because I can’t get it over here! It’s the best smelling hand sanitiser there is and it doesn’t dry my hands out at all! Will repurchase when I am home! I can’t find my usual dry shampoos – Klorane and VO5 - in Canada so I’ve been trying a few different ones, the first being this offering form Herbal Essences. I really like the scent but it unfortunately leaves a white cast in my hair so I won’t repurchase. Fortunately I got on much better with this one! Again, I love the scent and it rubs in really well leaving my hair feeling much fresher so I have repurchased a few times! It’s also super affordable when on offer at around $4! I got this in a build your own beauty box a few months ago and enjoyed using it over summer. It never made my hair feel oily or greasy and it always looked smoother when I used it! I would consider a repurchase in the future but at the minute I have a few other products I want to use up! This is probably my most repurchased skin product ever! I’ve talked about it loads on the blog but most recently here. Its my absolute favourite for a first cleanse as it’s so creamy and gentle and it does a great job of removing the bulk of my makeup while not breaking me out of casing a reaction. Forever repurchased! From one of my favourite first cleanses to a few of my favourite second cleansers! The Miracle Cleanser is so gentle yet effective at removing the last of my makeup and it smells so refreshing! I’ve never bought a full size as it’s so expensive but the minis last ages! Will always repurchase! I find this to be really similar to the Aurelia cleanser in scent and how well it cleanses. The Liz Earle one is a little thicker in consistency but it’s a lot more affordable so I will repurchase the full size again in the future! I enjoyed using this for the most part except when it got into my eyes where it burnt! It looks like a clay but is very oily and effective at removing makeup however I wouldn’t repurchase as it’s not gentle over eyes! I love this, its so gentle and cooling and perfect as a morning eye makeup remover. The little bottle has lasted me ages and I will repurchase in the future! Another mini from a GWP! I wanted to love this because the brands Restorative Tonic Mist is one of my favourite skincare products but sadly I just didn’t notice it doing much for my skin. It’s not a big enough sample to test properly and while I don’t hate it, I just don’t love it therefore wouldn’t repurchase. I got this in the subscription box I mentioned earlier and I enjoyed the scent and cooling sensation it gave but I have other facial mists I much prefer so I wouldn’t repurchase this one! The Mac Daddy of foundation for me, I love this stuff! It gives amazing coverage and looks better the longer you have it on! I have already repurchased because I cannot be without it! 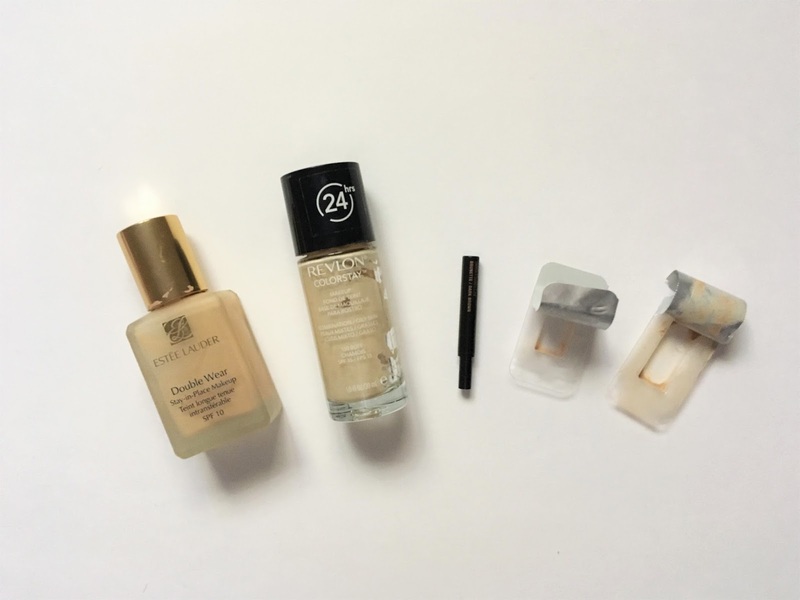 My favourite budget foundation – and a great option if you don’t want to fork out for Estee Lauder! Again it gives great coverage and lasts all day and I have repurchased! I’ve used up a mini of the Brow Wiz before and liked it apart from the colour match but this time the colour match was perfect It’s a super soft pencil and makes filling in your eyebrows so simple! I definitely want to grab a full size at some point! A little sample I wanted to include – I can’t really say much for the primer because I never really notice anything with primers but I was super impressed with the foundation! Obviously I only got one days use out of it but it lasted all day and gave me really good coverage so I’ve been weighing up whether to buy or not! I would love to hear your thoughts on the foundation if you’ve tried it! So that’s my first empties in quite a while and it felt good! The pictures are awful quality because I’m back to using my iPhone but we’ll roll with it! Let me know your thoughts on any of the products here! Hello! Is anyone still there? After a longer than intended break from blogging I'm going to try and kick my arse into gear and get back into the habit of posting semi regularly on here! I moved last week - same town just a different place with my own room so I think I can keep it up a bit more - I don't know why I hate people knowing I blog but I do so I just stopped. The beauty buying on the other hand hasn't stopped and there is lots I want to talk about but first up, following on from my Current Skincare | Cleansers post, I’m here with my toners today! This is a prewritten post from when I was still at home but I will do an updated version at some point too here in Canada! Toners are a very underrated product in my opinion and they are actually one of my favourite steps in my skincare routine. I love how they get any leftover residue from cleansers off my face as well as preparing my skin for the next treatment/moisturising steps in my routine. The only thing I really look for when picking a toner is that its alcohol free so here are my current picks! It wouldn’t be a toner roundup without this cult favourite! I have gone through so many bottles of this over the years and it’s a constant in my routine! It contains 5% glycolic acid and it a super gentle but effective exfoliating toner that helps to dissolve dead skin cells revealing the newer cells underneath! It also diminishes signs of sun damage, fine lines and scarring and is just all round bloody brilliant at doing all of these! This really helps smooth my uneven texture and just overall refines my skin! Its £18 for 250ml and a bottle lasts me ages with daily use! The most recent addiction to my toner collection and one I talked about in full here! It’s formulated for normal, dry and combination skin and contains Sodium PCA which attracts water molecules to the skin to help maintain hydration as well as Cypress tree bark extract, a natural astringent that leaves skin feeling fresh. This works perfectly at removing any leftover makeup or dirt from my face after cleansing and feels really refreshing. It doesn’t leave any residue behind and my skin feels soft and ready for the next step in my routine. It’s different to any other toner packaging I have as it comes in a spray bottle and I find that 6-7 sprays onto a cotton pad is perfect for me! You can also spray this onto your face during the day too if you wish – the mist is very fine and sprays evenly so it’s brilliant if you want a refresh! I do detect a light fragrance with this which I personally love but bare that in mind if you like fragrance free products and its $30! Bio-Essence is a Singaporean brand and I got this bottle from Cult Beauty though this product doesn’t seem to be stocked there anymore *cries*. The tri action that’s referred to in the title is the hydrating, nourishing and protecting formula. It contains two types of hyaluronic acid - power nano hyaluronic acid and hyaluronic acid. These help the toner to absorb into the skin quickly providing long lasting hydration and keeping the skin firm and plumped up. It’s also enriched with Cranberry Extract and Olive Oil which again keep the skin hydrated and are rich in antioxidants to fight free radicals. My skin feels so refreshed and – you guessed it - hydrated after using this, I love it! It has a really light scent that doesn’t bother me and I’m gutted I can’t find it online anymore though it was £14 when I bought it before Christmas! The only bad thing about this is that it’s not travel friendly at all – the glass bottle is so heavy and it can be quite hard to get the product out of the tiny hole in the top! The effort is 100% worth it though because it’s such a beautiful product! That’s the toners I’ve been using at home! Since I've been in Canada my toner collection has expanded so I will do an update soon but let me know if you have any other alcohol free recommendations! *denotes a PR sample that was sent to me. All opinions are my own. See my full disclosure here. Just before I left for Canada, a generous skincare package arrived for me from the lovely people at Purlisse. Having read some rave reviews by some of my favourite bloggers on the brand, I had no doubts I would enjoy the products and I have been proved right! Purlisse was founded by former actress Jennifer Yen (she was in Power Rangers dontcha know) as heavy makeup and bright lights affected her complexion. She created Purlisse – a combination of Asian wisdom and modern philosophy as well as partnering with chemists in France, Korea, America and beyond to perfect the skincare line. Most of the range I have here is from the Blue Lotus range - Blue Lotus is a powerful antioxidant known for its anti-inflammatory benefits. All products here are also free of parabens, mineral oil, phthalates, synthetic colour/fragrance and animal cruelty! I’ve been using the range for well over a month now so here are my thoughts! It’s infused with Soy Milk, Whole Oat and White Tea to gently wash away dirt, impurities and makeup in one simple step. It’s a soothing multi tasker that leaves skin pure and clean without stripping it of its natural oils and is suitable for all skin types. As well as blue lotus, the cleanser also contains White Tea which helps rejuvenate skin, Soy Milk which is rich in amino acids and maintains skin elasticity and whole oat to calm and soothe sensitive skin. I absolutely love how gentle this is. I do prefer it as a morning cleanse rather than a makeup removing second/evening cleanser as I prefer something more balmy or oily and this is a runny milk. It doesn’t strip my skin at all and leaves it clean and ready for the next step in my routine. It also comes in a huge tube and a little goes a long way! This promises to brighten and even skin tone while also reducing dark spots and is suitable for all skin types including sensitive. Again, as well as containing blue lotus, it’s also made up of Lupine peptides to improve radiance and promote a youthful glow, Vitamin C and Alpha Arbutin to brighten and even skin tone, Neem and prune extracts to fade away dark spots and Avocado oil and natural squalene to nurture sensitive skin. It’s really lightweight and sinks into my skin quickly which I love! I’ve been using this morning and night and am so impressed by how quickly my residual acne marks and scars are fading! My skin has been breaking out more since I moved away but this range has 100% been helping to keep it under control and fade the marks that are left over leaving my skin looking clearer quicker! This moisturiser promises hydration, fine line prevention and it’s perfect to use under makeup for normal, dry and sensitive skin. It’s got white tea included which offers anti-bacterial and skin soothing abilities, Vitamin E to prevent premature ageing and improve skin texture and French Marine Plants to help retain moisture. My skin is more on the oily/combo side of things but this hasn’t caused me to be any more oily that usual and I actually think my skin has dried out a little since I’ve been in Canada so this is perfect. It’s a gel cream hybrid, completely non-greasy and absorbs quickly into my skin like the serum. It works so well with my foundation like most of the recent moisturisers I’ve been trying out that my poor primers are taking a backseat because I just don’t feel like I need them! I haven’t noticed any dry patches since using this either so can’t recommend enough! I’m pretty hard to please when it comes to lip balms (see my disappointing products post here with cult favourite Nuxe Reve de Miel!) but this one I can get on board with! Quite literally as I took it with me on the plane to Canada – see what I did there?! It promises to hydrate and nourish, heal and soften and to my delight is petroleum free! It contains mango seed butter and shea butter which are highly nourishing and moisturising and also has Vtamins A, C and E. Jojoba oil provides anti-inflammatory benefits and soothes chapped lips while Rice bran oil hydrates and protects lips from UV rays and Vitamin E leaves lips supple and youthful. This lasts so long on my lips which I love! I hate having to reapply after 10 minutes! It gives a good amount of gloss too without being too much and leaves my lips feeling moisturised and soothed as well as plump looking! This sheet mask promised to be intensely moisturising as well as soothing and balancing. It contains White Mulberry to brighten and Anise fruit to provide continuous moisture leaving skin healthy, beautiful and radiant. I’m not an avid sheet mask user but I can safely say that I have found a favourite in this! I love the light scent and the mask itself is super saturated. I found it to fit my face really well and I didn’t want to take it off! I rubbed the remnants of the mask into my face and it felt so smoothing and hydrating I almost didn’t bother with a moisturiser. My skin always looks much more radiant and calmer the next morning! 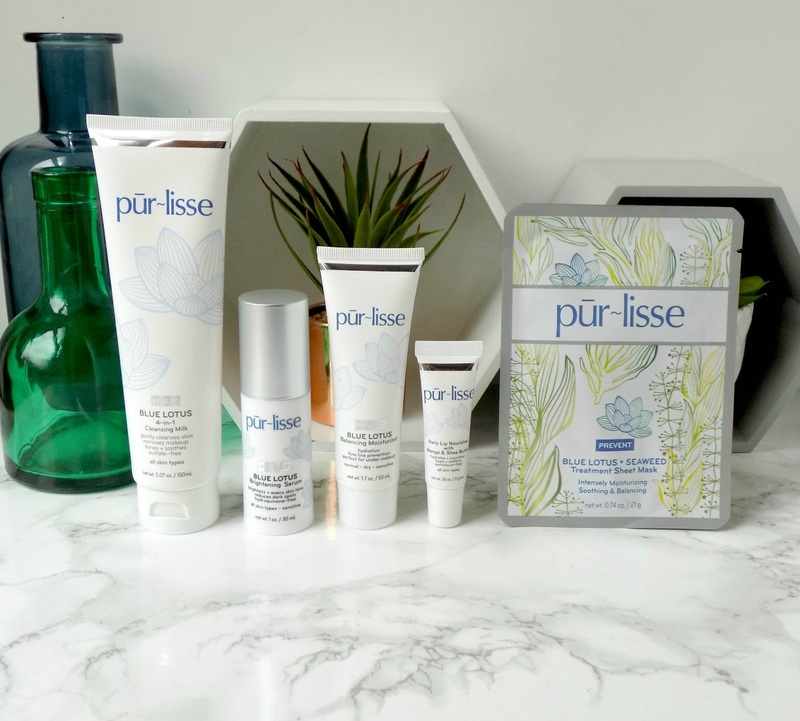 Overall, I am so impressed with the Blue Lotus range and Purlisse as a whole! The products are incredibly gentle yet effective and a joy to use! I highly recommend if you get a chance to try them! Eek, it's been so long guys! I'm sorry I'm not as active on here anymore but I really want to get what I've prewritten posted so here we go! I’m starting a new series here on the blog with the skincare I’m using in different categories so first up its cleansers! These are the cleansers I was happily using away at while I was at home. It’s not actually all of my cleansers, I do have a few others but I didn’t feel like I used them enough to be able to talk about them fully and there were already about ten here! I didn’t actually realise I had that many on constant rotation but what can I say - I like a clean face and I also like options! I’ll hopefully get an updated one up soon as I have a few different cleansers here with me in Canada and some are old favourites I haven’t used in a while! Are you sick of hearing me talk about this yet? It’s my absolute favourite for a first cleanse as it’s so creamy and gets the majority of my makeup off! I have been using this for years and don’t think I will ever stop! I’m not really into micellar waters which I know most people use hence why there is none in this post but this baby is a firm favourite and constant repurchase for me! This isn’t in the main picture because I was aiming this post at facial cleansers but I can’t talk about a first cleanse without the best eye makeup remover! If you like to cake your lashes in waterproof mascara and pile on the eye makeup like me then you need this in your life! It’s a bio phase formula and the oil works to break down waterproof eye makeup all while being super gentle, not stinging eyes or leaving a fuzzy film over them! This is a constant repurchase too and one I talk more about here! This is the newest cleanser to my stash and one I talked about originally in this Burt’s Bees post! It’s a 100% natural oil that feels lovely and luxurious when rubbing into the face and I love the scent – it’s not overpowering at all. I find my eyes are a little sensitive to this but nowhere near as much as say the Burt’s Bees Soap Bark and Chamomile cleansing cream. This leaves no oily residue on my face either; it just leaves it feeling really soft and supple and makeup free! Its £16.99 for 117ml! Another 100% natural product this time in balm form and one I only actually picked up because I was under the threshold for a Cult Beauty GWP one time! Anyway, I’m glad I did put it in my basket because this is so soothing and perfect if my skin is feeling a little stressed or sensitive. It leaves a little residue after wiping off with a facecloth but I don’t mind this and sometimes will pop some extra on and leave overnight if I’ve got a rough patch of skin – it’s a multiuse balm and can even be added to hot water and honey to soothe a sore throat though I haven’t tried that! I love the scent too and my mum always steals this! It’s £12.50 for 50ml. If I could only pick one (second) cleanser to repurchase this would be it! I have gone through countless jars of this and despite its pretty high price point I will continue to do so because I love it! This is so luxurious and soothing, and I find the scent so relaxing. It removes the rest of my makeup so well and makes my skin feel lovely and soft and ready for the next step in my routine. A jar lasts me ages and I always like to grab it when it’s on offer – I got this 50ml jar in a set of 3 for £38 (and then got 20% off too when M&S did an offer!). Another luxury pick and one I wouldn’t have thought to try had I not won it in a Cult Beauty Instagram competition! It’s a black oily balm made with Hungarian moor mud and thermal waters that works to draw out impurities. I find it very gentle on my skin and a tiny bit goes a long way with this balm! It comes with a little scoop to get the product out and I then warm it up between my fingers and massage into my face. After removing, I’m left with smooth, clean, hydrated skin! At £48, this isn’t cheap but I will definitely be making a repurchase when I finish this! I got this in a Cult Beauty GWP and I love it – seriously what is it with me and ridiculously expensive cleansers! The oil feels so silky and almost warms up as I massage it in feeling like I’m getting a mini facial. It smells amazing, gets the last of my makeup off really well and makes my skin feel soft and nourished. It’s also 100% natural and costs £64 for 125ml. This had been on my wishlist for the longest time before it finally came back into stock last year and it quickly became a firm favourite! It contains 5% glycolic acid so helps my skin along in the morning by giving it a gentle exfoliation and leaving it looking a lot brighter! It also contains nourishing oils, glycerin, aloe and hyaluronic acid so doesn’t strip my skin at all and leaves it feeling smooth which I love. It also made it into my Best Beauty Discoveries of 2016! It’s £18 for 135ml and was one of the first things I purchased skincare wise in Canada because I cant bear to be without it - I think it was $24! I snagged this just before Christmas in the sales in a set Deciem had on offer (I was buying it for the CAIS but this was a happy surprise!). The first time I used this I was a little put off by the smell (It’s a little like day old cold coffee) but I soon got over it and I reach for it regularly in the morning – it’s not intended to remove makeup! It promises to clean dead skin cells without peeling, remove dirt and clean pores intensely. It also helps remove the skin's natural oils gently to help the skin naturally produce more oils. It targets all forms of build-up, blemishes, congestion and impurities and my skin loves it! Its £21 for 90ml. I got this little gem in a build your own Latest in Beauty box before Christmas and it’s a beautiful cleansing cream! I actually though my tube was a full size as the sample Latest in Beauty had was so generous! This feels really gentle on the skin and I love that it has rose hip oil in it as its one of my favourite skincare ingredients! It’s got a really gentle rose scent and this leaves my skin feeling really hydrated on days when my skin feels drier than normal. The full size which comes in a tub is £38 for 200ml. I should also mention that I usually use all three of my morning cleansers with my Foreo Luna for a little bit of a deeper clean and exfoliation and all three work perfectly with it!